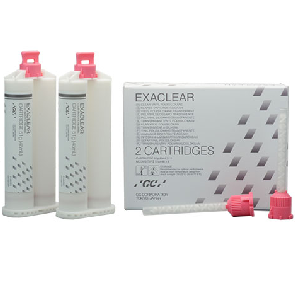 EXACLEAR is an innovative, clear silicone material made to fulfil the demands for high aesthetics while facilitating the way to great results. Its amazing transparency makes it particularly effective in complex clinical situations like wear cases, complex morphologies and challenging aesthetic cases. Its versatility in use makes it a perfect product to be used by a dentist, a lab technician, an orthodontist or an implantologist. Thanks to its transparency, ease of handling and rigidity after setting, EXACLEAR makes complex procedures much easier and provides a smoother workflow.